“four chars” is my personal project trending on Instagram. It features content-based illustrations with a vivid visual language. It all starts with an idea of creating doodles inspired by Chinese four-character words. Day by day, "four chars" grows into a design journal, where it contains my personal interpretations on a variety of words, slang, or memes. Being too tired to feel like doing anything. e.g. After one-week of working over time, I really feel 累感不爱. e.g. 我想静静, but please don’t ask me who she is. “Sleeping on a higher pillow” - Having nothing to worry about. e.g. After solving the problem, you will be 高枕无忧. As “four chars” gains popularity, people regard it as a language learning tool. Each four chars post is considered as a flashcard for Chinese learners worldwide. “Draw a dragon and put a pupil to its eye.” - Make the final touch to bring the art to life. e.g. You did well in writing this sentence, which works as 画龙点睛 for the whole article. “Being a frog at the bottom of a well.” - A person a with narrow view. e.g. Instead of being a 井底之蛙, we should broaden our horizons. “Seduce a wolf into the room". - Open the door to a dangerous foe. e.g. If you let a thief to keep your keys, it has no difference from 引狼入室. However, "four chars" hasn't been that perfect for language learning. Some of the illustrations are too sharp or abstract for people to understand. I am still honing my storytelling skills through this ongoing daily practice. 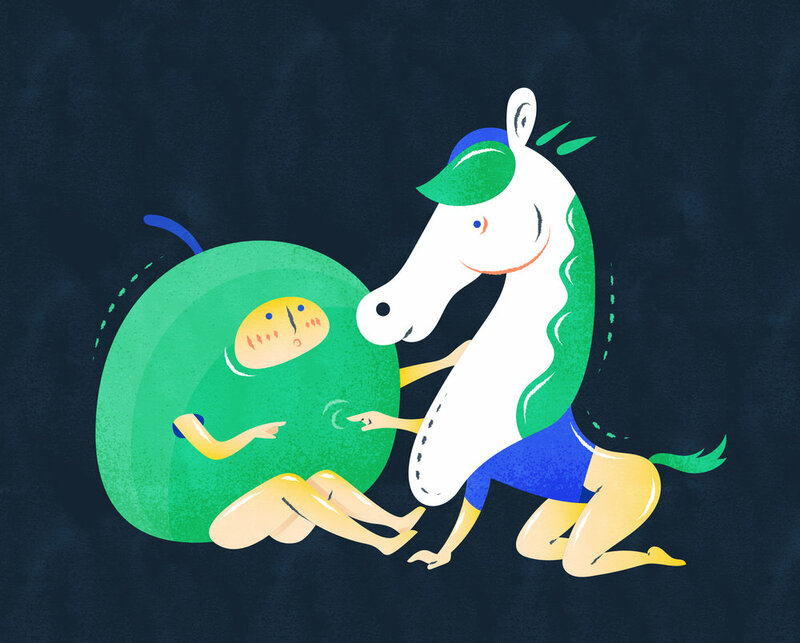 “Green plum and bamboo horse” - Intimate friendship formed in childhood. e.g. Growing up together, they are a couple of 青梅竹马. “Having spiritual rhinos in heart.” - People having mutual affinity; Minds think alike. e.g. My partner and I are 心有灵犀. “Point to a deer, and call it a horse.” - Deliberately distort the truth. e.g. Don’t believe the decisions made by those who 指鹿为马. Find more posts on @four_chars.